What Gods is Honored Here? : Writings on Miscarriage and Infant Loss By and For Women of Color. : New Book by Kao Kalia Yang and Shannon Gibney. What God Is Honored Here? is the first book of its kind—and urgently necessary. 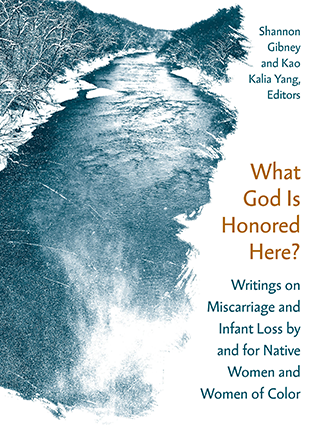 This is a literary collection of voices of Indigenous women and women of color who have undergone miscarriage and infant loss, experiences that disproportionately affect women who have often been cast toward the margins in the United States of America. From the story of dashed cultural expectations in an interracial marriage to poems that speak of loss across generations, from harrowing accounts of misdiagnoses, ectopic pregnancies, and late-term stillbirths to the poignant chronicles of miscarriages and mysterious infant deaths, What God Is Honored Here? brings women together to speak to one another about the traumas and tragedies of womanhood. In its heartbreaking beauty, this book offers an integral perspective on how culture and religion, spirit and body, unite in the reproductive lives of women of color and Indigenous women as they bear witness to loss, search for what is not there, and claim for themselves and others their fundamental humanity. Powerfully and with brutal honesty, they write about what it means to reclaim life in the face of death. 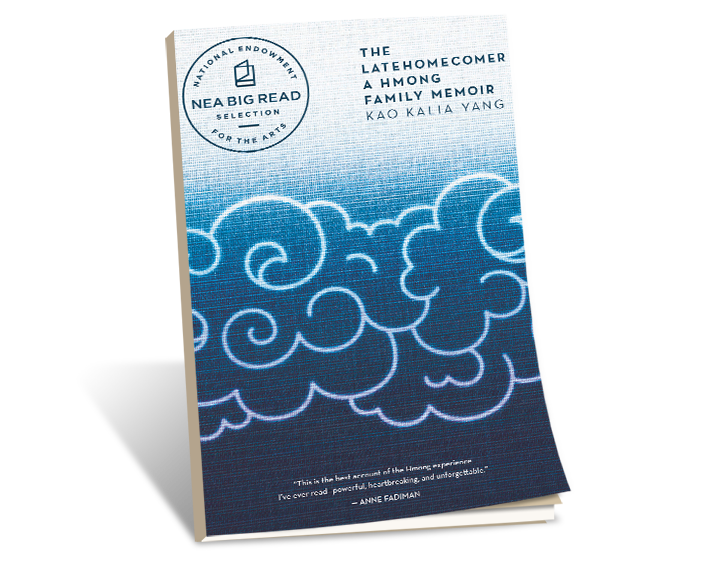 Editors Shannon Gibney and Kao Kalia Yang acknowledge “who we had been could not have prepared us for who we would become in the wake of these words,” yet the writings collected here offer insight, comfort, and, finally, hope for all those who, like the women gathered here, have found grief a lonely place. Contributors: Jennifer Baker, Michelle Borok, Lucille Clifton, Sidney Clifton, Taiyon J. Coleman, Arfah Daud, Rona Fernandez, Sarah Agaton Howes, Honorée Fanonne Jeffers, Soniah Kamal, Diana Le-Cabrera, Janet Lee-Ortiz, Maria Elena Mahler, Chue Moua, Jami Nakamura Lin, Jen Palmares Meadows, Dania Rajendra, Marcie Rendon, Seema Reza, 신 선 영 Sun Yung Shin, Kari Smalkoski, Catherine R. Squires, Elsa Valmidiano. 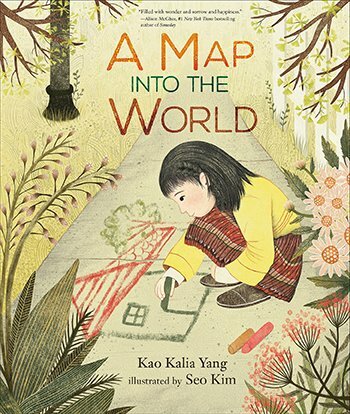 A Map Into the World (Carolrhoda Books, October 2019) is the first literarily published children’s book by a Hmong-American writer centered on a Hmong-American family. It is a the story of a young Hmong girl’s discovery of the changing seasons of a year and the different seasons of a life. A watermelon growing big and round. A yellow leaf fallen from a tree. A handful of glittering snow. The first worm of spring. As the seasons change, so too does a young girl’s world. She moves into a new home with her family and encounters both birth and death. As this curious girl explores life inside her house and beyond, she collects bits of the world. But who are her treasures for? The story is about a young Hmong girl’s search for beauty and connection in a busy world, lushly illustrated by Seo Kim. *The Song Poet is available in hardcover, paperback, audio, and as an ebook.. Please follow this link The Song Poet. The Latehomecomer is the story of the Hmong people and their long journey to America. Commissioned by the Central Intelligence Agency of the United States of America to fight in the Secret War in Laos, many Hmong families were abandoned when the American troops withdrew from the war. Faced with genocide, thousands of Hmong families fled into the jungles of Laos and eventually the refugee camps of Thailand. Kao Kalia Yang’s family arrived in America in 1987. It would take over twenty years for the story of the Hmong family to emerge in the landscape of American literature. The Latehomecomer is an intimate portrait of love and family; it is a seminal work in American history and the politics of war. Please follow this link to purchase. 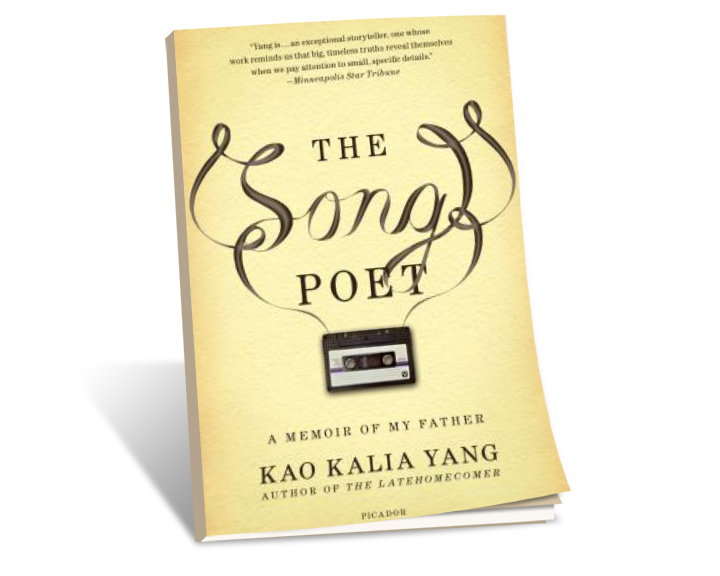 The Song Poet (Metropolitan Books, published 2016) The Song Poet emerged from a conversation with my father, Bee Yang, a Hmong man working in the factories of Minnesota, a man whose life has been marred by war and poverty. I asked my father how he became a song poet in the Hmong tradition. He told me a story about a young boy growing up without a father and a mother who worked endlessly to provide for her nine children. My father told me that as a boy he used to go from the house of one neighbor to the next collecting the beautiful things people had to say to each other. By himself, he whispered the words to comfort his heart. One day the words escaped on a sigh and a song was born. I told him that it could be the beginning of a book. He told me that no one would want to read a book about a man like him when people could read books about men like Barak Obama (my father loves Barak Obama) written by themselves. The Song Poet is me taking on my father’s story and his songs; it is a tribute to his form, kwv txhiaj, and the poetry that has sheltered us from the poverty of our lives. *The book is available in paperback, audio, and as an ebook.